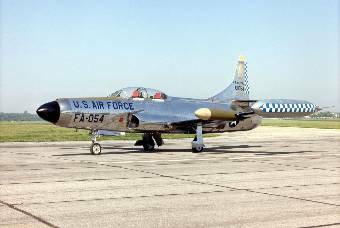 On April 14, 1958, an F-94 Starfire jet was returning to Otis Air Force Base after a training flight when it was discovered that the landing gear wouldn’t come down. The pilot, 2nd Lt. Ragner Erickson,and his radar observer, 1st Lt. Francis DePipi, circled the area for 45 minutes using up the fuel supply as base fire crews coated the runway with foam. When it was time, Lt. Erickson brought the aircraft in for a wheels-up belly landing. The foam did its job and there was no fire. The crew was uninjured.